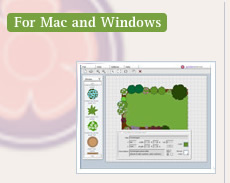 Design your dream garden with this very easy to use program. Windows: Windows 10 or Win 8, Win 7, Win XP, Win Vista and 20M hard disk space. The system requirements for the trial version and full version are exactly the same, so if the trial version works on your computer then the full version will too. You can buy it here through our secure shopping site... just pay, enter your activation code and get designing. Your Licence Key is delivered via e-mail immediately upon payment authorization. Download version : How it works: you pay for a licence for the program and are provided with a licence key. You enter the licence key and the trial version automatically converts to the full licenced version of garden planner. It's fast and easy.